Where Are The Top 5 Biggest New Year’s Eve Parties Around The World? Not content with listing the best New Year’s parties in the world (everyone knows this occurs at TheExpeditioner.com’s annual New Year’s party where we break out the bottles of Boone’s Farm and Twister for a rockin’ evening), I decided to find out where the biggest parties in the world take place. 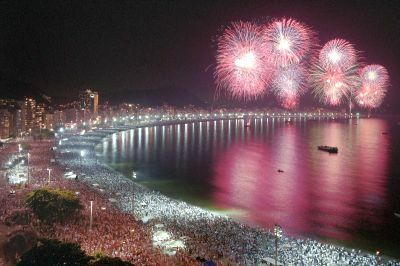 The record-holder for the largest New Year’s party in the world goes to Rio de Janeiro where 4 million people packed the beaches of Copacabana in 2008 (although this number dwindled to only 2 million at last year’s 2009 celebration). Over 1.5 million people pack Sydney’s harborfront on New Year’s to watch 3,000 kilograms of explosive devices, including 11,000 shells, 10,000 shooting comets and 100,000 individual pyrotechnic effects get lobbed into the air over the harbor for a spectacular fireworks show. Coming in at number three is New York City’s Times Square celebration. An estimated crowd of over 1 million people cram into the cavernous recesses of Time Square to watch the 1,875 pound, 2,668 Waterford Crystal-covered ball drop at midnight. Little known fact: of the 1 million people in attendance, there are actually no New Yorkers there. Yeah, surprising. A relatively new annual event (for obvious reasons), Berlin’s celebration along the Party Mile (June 17 Street) between the Brandenburg Gate and Victory Column attracts roughly 1 million people. Rounding out the top five is London, where 400,000 people pack the banks of the Thames for a giant fireworks show and to collectively grumble about the presence of the London Eye. Las Vegas, Edinburgh, Prague, Paris, and Taipei all come very close to cracking the top five. Better luck next year!